Volpe developed a guidebook that discusses the steps taken during the pilot project and presents lessons learned and recommendations that will guide other areas in pursuing a similar multiagency approach to reduce greenhouse gas emissions and plan for climate change impacts through integrated transportation and land use scenario planning. In addition, the scenario-planning consultant has produced a supplemental report that details the methodology and results of the scenario development and includes discussion on limitations and future opportunities. The Federal Highway Administration funded Volpe to develop an "Action Plan" for the Cape Cod Commission. 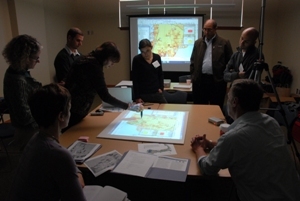 The Action Plan summarizes the data, methods, and assumptions used to develop the refined scenario, as well as opportunities to integrate the refined scenario as it currently stands into regional and local planning processes and build upon it using CommunityViz. If you are interested in pursuing a process similar to that which this project employed, please contact the project manager (see right column).